Change has been the general theme for us around here. There's been the start of school with a new teacher in a new classroom to adjust to, a bit of travel thrown in, and of course there's the weather which is being its usual Pacific Northwest self: predictably unpredictable. I've been realizing more and more, though, that that's okay. To have things shift around, make you suddenly crazy-busy or just feel crazy. To not be sure if it's going to rain downpourishly for the five days or not. We just can't predict much of it, but we can adjust to the changes as they happen. One of the main reasons why I've been thinking this way, in addition to the above mentioned stuff, is that we've had a lot of incredibly challenging moments recently with Kingston, in terms of his behavior. It is absolutely developmentally normal for kids of his age (four going on five) to want to say just what they think (often in a less than kind way), assert themselves boldly and completely ignore what you or any other grown up asks them to do. Okay, that was an understatement. It is terribly, terribly hard. But I've learned, with the help of some very smart and loving people in my life, that it's okay to feel that it's just awful and that what a kid who is not behaving and even being aggressive needs more than anything is a combination of empathy and authority. Hold the boundaries! Set limits! But do it with warmth and love. One person even described it to me like this: "You're the benevolent queen...Act like the benevolent queen." After she said that, things just clicked. Kingston and I started to get along better. As the queen of my kingdom, I said enough when it was enough (Um, like, no, we can't put "Froggy Went A' Courtin'" on a loop so that it's the only song that plays for every single second of the day just because that's what you want even if you scream about it.). And things have started slowly to change. My little minion (said lovingly, of course) seems to be getting that I'm firmly saying no or correcting him because I love him and don't want him to grow up to be a narcissistic terror of a person. Or maybe, he doesn't understand it that way, per say; he just knows that mama loves him. Period. Underneath that sometimes tough queenly benevolence, good things have come to the surface for us. I've been feeling cautious relief. Especially when we have moments like yesterday, when we lay in bed in the morning and drew tons of spider webs together in an old notebook. Or, later the same afternoon, when we sat at the table and drank hot chocolate together, addressing one another as Mr. Dog (him) and Mr. Cat (me). Life reminder: when you can ride through the changes, the really difficult moments, allowing the stuff underneath to rise to the surface, you'll be surprised, maybe even grateful. Oh, and don't forget that you are the benevolent ruler of your own little kingdom, indeed. Speaking of what lies beneath the surface... I don't know why it took me so long to read Susannah Clarke's wonderful novel, but an 800-page book about magic and fairies and spells to summon anyone you want through time and space... Well, that was a good, escapist thing to be reading while going through my ups and downs with my child. One day, snatching a few minutes to read while locked in the bathroom (okay, other parents, feel free to admit that you have done this), I came across the above passage and decided I had to make my own pork pie. Nothing, nothing at all like an English pork pie, which is packed to the limit with various incarnations of pork products so that it's actually more like a crust-encased terrine. Nope, this is my version, which probably more closely resembles a sort of pot pie and is packed with potatoes and apples instead. Magical in its own way. Enjoy! One recipe for double-crust pie, such as this one. Roll out half of pie dough into a 14-inch diameter circle. Place in glass pie pan. Trim so that there is a 1-inch overhang. Wrap well and place in fridge. Roll out top crust in same manner and place on a baking tray. Cover well and place in fridge. Crust should be chilled for 2 hours to overnight. When you are ready to put the pie together, preheat oven to 450°F. Spoon filling into prepared bottom crust. Cover with top crust, cutting vent holes for steam release. Beat egg yolk and water together. Brush egg wash over top crust. Place pie on middle rack. Bake for 15 minutes then turn temperature down to 400°F. Bake for an additional 45 to 50 minutes, until crust is golden. Serve warm or at room temperature. The other day around dusk, I was standing on a trail behind our house. I was feeling a little daydreamy, glad to have time to wander through the woods with the dog before dinner. Beneath a spot full of vine maples, I waited while the dog finished sniffing a deer fern. Suddenly, I heard a strange, rapid noise. Click-click-click-click-click! Then again, and yet again. I looked up to see leaves the size of my palm vibrating against one another in the wind. Click-click-click-click-click! I stood for a moment then glanced down at the dog, who was now waiting for me. Well? Shall we go on? his expression seemed to ask. I remained still, listening. In that moment I realized for the first time since living next to the woods these six years that the sound of the wind is not one entity, a single whoosh tearing through cedars and maples, thimbleberry and birch. It is made up of many small clicks, snaps and reverberations like that of the leaves now vibrating around me. Such a thing may seem small, not worth holding onto. But it was a reminder to me of what our former Washington State Poet Laureate, Sam Green, calls "small noticings." At a workshop of his which I was able to attend in June, he explained that these tiny, everyday details are what make poetry come alive. I would also argue that these "small noticings" are a lot like catching fairy dust.. When we have these miraculous particles in hand and are able to fold them into ourselves, we inevitably become more alive. Sam Green also spoke about his daily practice of writing at least three "small noticings" in a notebook. I think it's a practice worth emulating. Do it for a few days and I swear the noise around you will dampen down while what you'd otherwise miss comes more sharply into focus. The waves on the Lake, crinkles on a woman's dress. The dog and I eventually continued on. We looped around until we returned home, where it was time to get back to the flat reality of domestic life and finish cooking some dinner. I had soup ready, but I wanted a flatbread to go with it. The dough was already made and had been sitting on the counter while the oven heated up. I began peeling my squash, cutting it into thin slices while considering the wind and its many incarnations. Some, like these, whose very names impart magic...Papagayo. Mistral. Typhoon. Dough barely adapted from Jim Lahey. Preheat oven to 500° F. If using a pizza stone, place stone on top rack. In a small saucepan, melt butter over low heat. Once barely melted, add sage leaves and allow to crisp. Remove sage and set aside. Keep a close eye on the butter, as from here it can quickly go from brown to burnt. When brown and nutty, remove from heat and set aside. In a medium bowl, whisk together flours, yeast and salt. Add water and mix together using a wooden spoon. The dough will appear quite damp. No need for alarm. This is okay. Cover the bowl tightly with plastic wrap. I like to place a kitchen towel on top as well. Allow to rest at room temperature for 18 hours, or until the dough has doubled in size. Divide the dough in half. On a floured surface take one portion at a time and gently fold it four times, starting with the right side and going around counterclockwise. Shape dough into a ball. Repeat with the other portion. Cover both with a towel while you prepare the topping. Very thinly slice butternut squash using a knife or even better, a mandoline if you have one. Make enough slices to cover the surface of a 12-inch round of dough (about 12-14 slices per, you may have extra depending on the size of your squash). Set aside. On a piece of parchment paper stretch out one round of dough until it is approximately 12-inches in diameter. The dough should be quite thin once stretched out. Places slices of butternut squash on the round of dough. Scatter crisped sage leaves. Drizzle brown butter over the squash. Brush edges of dough with more butter. Sprinkle with salt and pepper to taste. Slide onto pizza stone and bake for 11-12 minutes, until golden and crusty. Repeat process with remaining dough. If you really want to live large, drizzle more butter over the finished flatbreads. Senegalese Peanut Soup and A Soup Swap! Well, that was a busy weekend. On Friday, we attended our first Michaelmas celebration. Since Kingston just started preschool three weeks ago, it was our first school festival. As the grade schoolers gathered in a large circle, we sat at the edge of the wooded playground with other parents, friends and acquaintances eating our picnic dinner while we watched a dragon get slayed. Because that wasn't enough excitement, Kingston helped use a two-man saw to cut a log into chunks. He then promptly went over to the hammering table and began putting 1-inch nails into a piece of wood he'd just cut. We watched the fifth grade parents work the apple press to make cider using fruit collected from all the families. We shared an abundance of home baked bread slathered with butter. Then all the way home, Kingston chanted, "Michaelmas, apple sauce!" Just because. But Saturday was a new day as we put our Friday adventures behind us. It was our Fall Soup Swap and it was a good one. 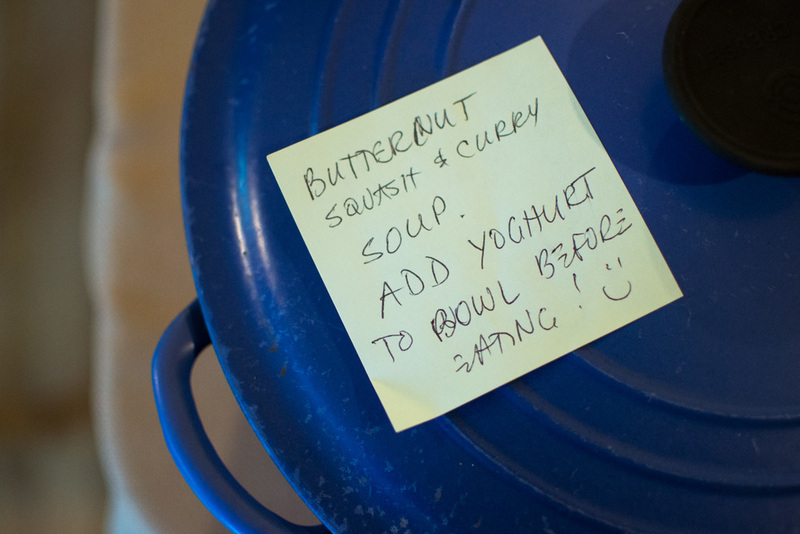 If you have never been to or hosted a soup swap, maybe it's time to join in and make one happen. It is the best reason to gather a bunch of friends and neighbors together and a chance to fortify everybody when the weather starts to take on a chill. All of the soups we had were delicious. Butternut squash and curry, carrot yogurt, Tuscan white bean, pumpkin and Jerry Traunfeld's herbed black bean concoction. I made Senegalese peanut soup. Everyone brought containers and filled them up before they went home. Lately, I've been on a soup kick and I can't help it. Soup in all its incarnations is one the greatest things a person can cook or eat. It's not usually complicated, it's nutritious and you can generally feed a lot of people with a single pot. Our soup swap underscored all this plus more. People love sharing. People love trying out new flavors. They love taking home quarts of soup that they didn't have to cook. They are happy to know there will be a meal or two they won't have to make, other than heating something up. There's also the bonus of getting to visit with one another. Senegalese peanut soup is one of my favorites. The best version I've had is the one that Jim makes at The Rhody Cafe and the Farm to Market Bakery (next door to the cafe) down in Bow-Edison. If you ever find yourself driving south from Bellingham down Chuckanut Drive, you will see it on the left side just before you get to Bow Hill Road. Jim's version is full of shredded chicken and is warming and complex. It's offered every day both at the Cafe and the Bakery, served with pieces of the Breadfarm's most perfect baguette. But circling back to Michaelmas, it is a festival that has been celebrated since at least Roman times, if not earlier. There are different stories related to it including that of St. George slaying a dragon to save an entire village. It's a reminder of the personal dragons we each have and the need to find the courage to tame them. Gathering together, finding strength through community by sharing something as simple as soup is one small way to shore ourselves (in these northerly parts especially) against the darker months ahead. As our school newsletter states, "Let's use the energy and focus of the Michaelmas season to resolve to be courageous -- which means 'take heart,' subdue our inner dragons and serve the good. Celebrate our inner strength and courage and let Hope and Love prevail." Or, as Kingston says, "Michaelmas, applesauce!" And as I say, "Soup Swap!" This soup happens to be dairy and gluten free, vegan and vegetarian. It does, however (and unavoidably) contain plenty of peanuts, as the name suggests. Slightly adapted from Soup Club, a book that celebrates friendship, food and sharing through a soup club in New York City. Use the side of a large knife to crush the peanuts. In a large pot, heat the coconut oil. Add the onions, ginger and garlic. Saute until soft, about 5 minutes. Add the salt, curry and red pepper flakes. Cook for 2-3 minutes longer until the spices are fragrant. Stir in the tomatoes then the sweet potatoes. Cook for another 2-3 minutes, stirring. Roughly chop half of the cilantro and add to the pot. Add 4 1/4 cups water and the coconut milk then give the soup a good stir. Bring to a boil. Reduce to a simmer and cook for about 20 minutes, until the sweet potatoes are tender. Remove from heat. Into another container ladle out 5 cups of the soup, including chunks of sweet potato and pieces of tomato and onion. Set aside. Stir peanut butter into the remaining soup in pot. Use an immersion blender to puree until peanut butter is incorporated and soup is fairly smooth. Return the unblended portion to the pot. Add the chard and stir. Allow chard to wilt. Adjust soup for salt and add pepper as desired. Serve in bowls garnished with cilantro and peanuts. It came upon us as quick as a blink, didn't it? I can't say I was completely ready. Of course I'm talking about our old friend, Fall. What a summer we had here! Glorious it was and longer than our typical (and measly) eight weeks. This year the sun and warmth stretched impossibly across late spring well into the third week of September. The long days of light! We were living the dream. I do love the Fall, though. Cool mornings with spider webs damp and glistening in the light, fog hanging low across tree tops. Sitting by the fire at night. Then, of course there's soup. Late last summer, I became obsessed with April Bloomfield's Summer Tomato Soup. I couldn't stop making or eating it. The minute I stopped eating it, I would start thinking about it again, the memory of its umami flavors causing the most primitive parts of my brain to clang, "Make soup. Again! Must eat!" Some of you might think it's a bit late to be talking about tomatoes, but I know that a good tomato or two can still be found (I've seen them with my own eyes at the Ballard Farmer's Market most recently). Stragglers though they may be, they must be used, so this is what you should do with them without question: Make soup. This soup takes those end-of-summer tomatoes sitting on your counter and combines them with the straggler red bell peppers that you also still have on hand. Roast the peppers to the point of blackened char. Skin them. Add them to the tomatoes with salt, olive oil, a smidge of water. Toss in a few basil leaves and you're done. So easy. Low effort for a spoonful of glory. Fall and winter can be hard on those of us who live around here. It gets so dark and stays damp for such a long time that light and warmth can become an abstract idea, a mere daydream. To gird against such occasions, it's best to make some extra of this soup and freeze it. Now. When darkness and rain envelopes us soon enough, late summer will live on, if only in a bowl. Preheat oven to 475°. Place peppers on side on baking sheet. Once the oven reaches temperature, place sheet in oven. Roast peppers for 20-25 minutes, until blackened and blistered. Immediately place peppers in a large bowl and cover with plastic to allow peppers to steam. Once they have cooled, peel skin and remove stems and seeds. Set aside. Place a fine-meshed sieve over a large bowl. Cut tomatoes in half, removing stems and any hard parts. Gently squeeze tomatoes over strainer, allowing juices to run through. Using fingertips, push any remaining seeds out of the tomato flesh. Place pieces of tomato flesh in bowl with juice. Place 3 tablespoons olive oil with garlic in a medium pot. Cook over medium-high heat for a minute or two until garlic is just becoming golden. Add tomatoes and their juices and peppers. Add 1 teaspoon of salt and a few of the basil leaves. Give everything a stir and cover. After about 5 minutes, when tomatoes and peppers are swimming in juices, uncover and add the water. Stir. Adjust heat so that the mixture simmers gently. Allow to cook for 20 minutes. Once the mixture has cooked, turn off heat, add the other 2 teaspoons of salt. Add remaining basil leaves. Add pesto if using. Add the 1/4 cup of olive oil. Using an immersion blender, blend soup until it has emulsified and become smooth and creamy. Adjust salt if you like. Serve warm in bowls.